Wed., Dec. 20, 2017, 6 a.m. The 2017 Christmas Bureau has closed, but that doesn’t mean our work is done. 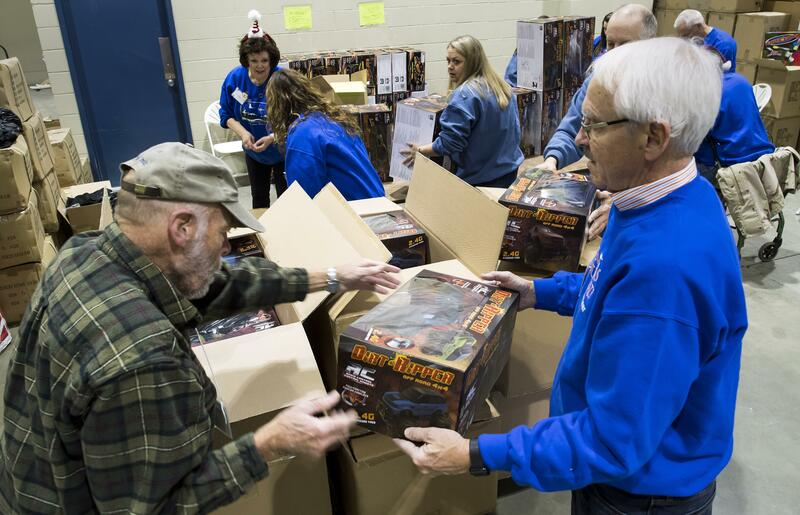 Garco Construction has come through with its annual donation of $25,000, but there is still $134,250 that needs to be raised to meet the goal of $525,000 to pay for the food vouchers, books and toys given out during the Bureau. The numbers of those seeking help at the Bureau this year were almost exactly the same as the number assisted last year. This year 26,103 people in 7,532 households received assistance. Of those, 12,059 were adults and 14,044 were children. In 2016, the Christmas Bureau assisted 26,012 people in 7,540 households. The number of children served this year is up over the 13,786 children assisted last year. This year’s recipients reported an average gross monthly income of $1,405, though income is not verified. While it seems like donations are slow to come in, McCann said he has faith the community will come through. Donations over the weekend brought in $57,449, bringing the year-to-date total to $390,749.95. Ken Roberts of Spokane donated $1,000 in memory of his wife, Sharon, who died in May. “She had a heart for children and we both are thankful for all you have done for the community these many years,” he wrote. The Tiffany children donated $1,000 in memory of John and Dorothy Tiffany. “This was one of their favorite charities,” they wrote. Reamer Family Dentistry of Spokane Valley donated $500. Wagstaff Inc. of Spokane Valley gave $500, as did Maryann Cooley of Cheney. Wilbur Yates of Spokane contributed $425. Harry Fuhs of Spokane sent $400. Roofers Local No. 189 donated $300. Jim and Lynn Kimmel of Spokane gave $250. Dennis Fiess and Lisa J. Brown each donated $250 via Pay Pal, as did Kristen and Dan Edgar. Donald Gale Jr. of Spokane gave $250. Kenneth Hill of Spokane and Dorothy J. Elder each donated $200 via Pay Pal. Theresa and Jeffrey Utesch of Veradale gave $200, as did three anonymous Spokane donors. Annalie Evans sent $200 via Pay Pal along with a note that read: “This donation is in lieu of Christmas gifts to our family.” Two anonymous donors each contributed $200 via Pay Pal. “Thank you all for doing such an amazing job,” one of the donors wrote. Dayton and Norma Wells of Spokane contributed $200, as did Carl and Anna Rabe of Spokane. The Quilt Charmers, a group of local women who make quilts to donate to charity, gave $200. “Bless you for all you do for our Spokane citizens,” wrote member Diana Gentry. Frank Puschak gave $150 via Pay Pal. Dalene and James Boone of Spokane sent $150. Dave West donated $150 in memory of Howard West. Meredith Hilby of Liberty Lake donated $125, as did Charles Horgan and Andrea Sharps. Donna and Nicholas Zolecki of Veradale sent $125. Les Hunt gave $100, as did Joan Menzies. Jean Rose and Lorraine Duffy, both of Spokane, each gave $100. Paul and Peggy Smart of Spokane Valley contributed $100, as did Earl and Elaine Shaw of Spokane. Barbara and Andrew Clark and Linda and Gary Faire, all of Spokane Valley, each donated $100. Janet Robel of Spokane donated $100. Karen and Richard Steele gave $100. Bruce and Lynn Wagner of Spokane donated $100, as did Bob and Kathy Bohlen of Spokane. Carolyn Gowdy of Spokane contributed $100. Miriam Finnegan of Spokane gave $100. Joann and David Savage of Mead sent $100, as did Jim and Barbara Groves of Spokane. An anonymous donor gave $100 in memory of Joe and Irene Lynch. Mary Cannon of Nine Mile Falls contributed $100, as did Raymond Morrison of Deer Park. An anonymous donor contributed $75 via Pay Pal. Catherine Lundberg of Spokane gave $75. Julie Rose of Riverside Middle School sent $75. “My class and I would like to say ‘Thank you’ for all you provide for our community; especially helping children experience joy during this season,” she wrote. Katherine Wooley of Spokane donated $50 via Pay Pal in honor of Larry Reuthinger of Deer Park. Emily Gordon of Spokane gave $50 in honor of Becky Nappi and Tony Wadden. Kassia Kain of Spokane donated $50 via Pay Pal in honor of Christmas Bureau volunteers Brigid Krause and Sierra Heinen. Gary Fiscus of Liberty Lake sent $50. Susan LeMay, Julie Aller and Percy Lynch each gave $50 via Pay Pal. Maren and Brian Bofenkamp of Spokane donated $50, writing that they are “thankful for our beautiful grandchildren.” Sharon and Charles Preston of Nine Mile Falls gave $50. An anonymous donor gave $50 in memory of Don Morley. W.T. and Charlotte Ardiss of Spokane sent $50. Fran Mitchell of Rathdrum donated $50 in memory of her husband, Dale, and son Rory. “Thanking all you workers that do so much every year,” she wrote. Jena and Mark Hollenbeck of Spokane gave $50. “This small gift is made in memory of my mother, who loved Christmas,” wrote Jena Hollenbeck. Touchmark Quilters donated $35. Deborah Carpenter gave $25 via Pay Pal. Preston and Carolyn Smith of Spokane sent $25, as did Sharon Agre of Cheney. June Lawson donated $20 via Pay Pal. An anonymous donor contributed $20, as did Donald and Rosemarie Rader of Spokane Valley. Published: Dec. 20, 2017, 6 a.m.